For us grilling enthusiasts, any sports event or holiday is a grand opportunity, nare I say duty, to fire up the grill and display our grilling prowess. March Madness is one of the high points of every year – three weeks of games and excitement – and it is our God-given responsibility to provide righteous fuel for all that game watching. This is Grill Madness, our series over the last two years that brings awesome recipes for entertaining as we watch our brackets crumble. 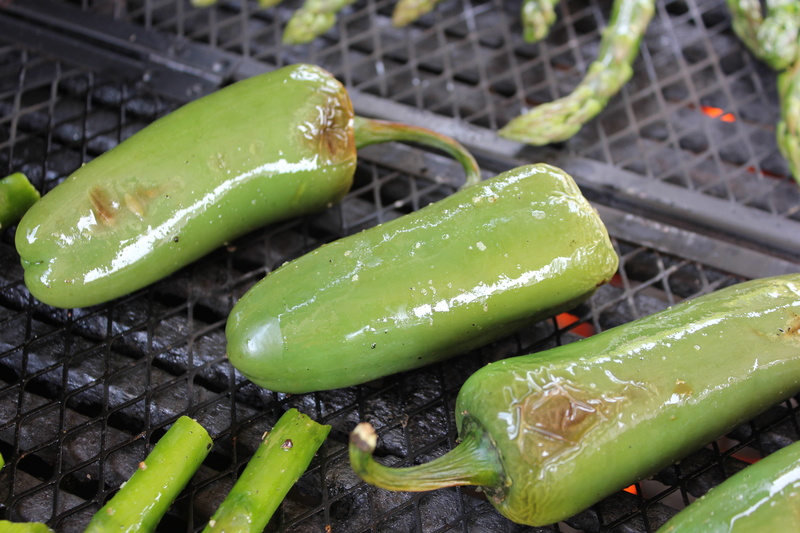 This year we present Picadillo Poppers – fire-grilled stuffed jalapenos rich in flavor and texture. Be sure to double or triple this recipe, as these will disappear fast. For the filling, in a large skillet cook ground beef and onion over medium-high heat until meat is brown and onion is tender, using a wooden spoon to break up meat as it cooks. Drain off fat. Stir in cooked rice, the 1 cup cheese, raisins, olives, and sherry. Set aside. Cut a lengthwise slit in one side of each jalapeno pepper to create a pocket, being careful not to cut the pepper in half. Cut a very small crosswise slit on both ends of the long slit, making an I-shape opening. Leave stem intact and use a small spoon to remove seeds and scrape out membranes. Spoon filling into peppers. If desired, sprinkle grilled peppers with additional cheese. *Note: Because chile peppers contain volatile oils that can burn your skin and eyes, avoid direct contact with them as much as possible. When working with chile peppers, wear plastic or rubber gloves. If your bare hands do touch the peppers, wash your hands and nails well with soap and warm water.